Այստեղ ու այնտեղ. ով՞ ես դուն. Արդեօք պիտի վերադառնամ՞ Երեւան – վան – վան. Nora Nadjarian (b. 1966 in Limassol, Cyprus) is an Armenian-Cypriot writer and poet. She studied in England and Switzerland. Her poems deal with everyday episodes which go beyond reality in their atmospheric concentration, pointing to symbolic interior worlds. 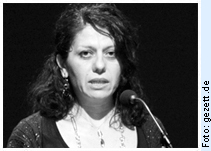 She writes her poetry mainly in English and Armenian, with a small number in Greek. In her poems she processes her multi-cultural, polyglot make-up. She is a regular participant at poetry festivals, literary conferences and projects in the English-speaking world. Her poems have appeared in German translation in the anthology “Zypern literarisch” (Embassy of the Republic of Cyprus 2008) and in the Literature section of the Cyprus special edition of “Jungle World” 10/2009. She has been concentrating increasingly on writing short stories over the past few years; following “Ledra Street”, she is currently working on the publication of her second collection of stories.